Shopping retail lighting stores to find a fixture that enhances the beauty of your kitchen can be a challenge. Consumers excited about the prospect of renovating their Michigan home are often confronted by a huge array of contemporary lighting styles and accessories to choose from. Choosing the right products for your kitchen remodel can be daunting, to say the least. If you are on this post looking for assistance in finding the best home lighting solutions available, our lighting company in Shelby Charter Township is here and ready to help. The Shelby Design Center has proudly served as your all-in-one stop for quality design solutions for every customer that walks through our doors. Our expansive 20,000 square foot lighting showroom ensures that you are able to find unique, beautiful design choices that can provide years of enjoyment. When it comes to the kitchen, getting everything juuust right can be a challenge. 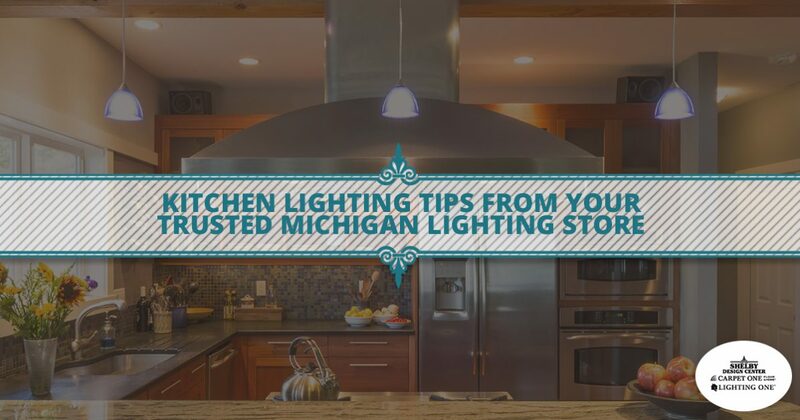 Today, we’ll go over a few basic tips that may help you in better preparing for your kitchen lighting project. If you’re ready to start shopping, be sure to stop by our lighting store in Shelby Township today! A lot of the visual appeal of your modern lighting scheme will depend on their scale in relation to the spaces they are illuminating. Choosing a fixture that is too small will make your kitchen feel cavernous and cold, while a home lighting fixture that is too big can dominate the space and crowd your guests. Many home design experts will utilize quick measurements to ensure that your fixtures fit the space they’re made for. Pendant lights over a counter or island, for example, should not crowd the edges of your surface. We recommend at least five inches on each side, or a 10-inch radius reduction to find a smooth fit. In many cases, the size of your lighting will depend on your space. Michigan homes that feature a kitchen that also meets the living room and dining area should focus on smaller, less obtrusive elements to allow guests and inhabitants unobstructed views. Once you have measured your kitchen and have determined the best flush mounts and hanging lights to grace your place, it’s time to space them out perfectly. How much space you give your fixtures and how high you place them will play a major role in the overall quality of your lighting design. When measuring your island, for example, be sure to space out your lights out evenly. Two- or three-pendant designs can do much to provide illumination without obstructing the space. Homeowners who get caught up in the excitement of kitchen lighting can soon find that they have overdone it with their design, so be careful! One beneficial trick that can inject some livelihood into your Shelby Township kitchen is color. While this is often done with an emphasis on the walls, cabinets, and countertops, matching your home lighting products to the space’s unique style can help bring your kitchen design to the next level. You can find a pendant with beautiful patterns and colors to either complement or contrast your color scheme for an added pop. Some shoppers will find that a small upgrade (such as changing the cord color) may make all the difference. The top section of your kitchen is reserved for quality downlights that can provide top-notch ambient lighting. This area is reserved for the biggest fixtures, including chandeliers, pendants, and other hanging lights for design appeal. This element draws the eye upward and helps to set the tone for the rest of your space. The middle section of your home serves as the visual palette for painting with accent lighting. Beyond ceiling mounts, your surfaces will be the perfect spot for wall lighting such as lanterns, sconces, and more. This third of your kitchen is the perfect opportunity to highlight artwork on the walls or a unique design element. The bottom third of your kitchen lighting design will range between the cabinets, countertops, and flooring. This space is often underutilized, providing the perfect place for under-cabinet lights to help you with your daily tasks, including food prep, cleaning, paying bills, and whatever else your kitchen is convenient for. Determining the best lighting plan for your kitchen can be difficult. Our advice? Plan ahead and work with your trusted lighting store in Shelby Township for assistance. The Shelby Design Center is proud to be your source for expert guidance and amazing design solutions. Contact us today or stop by our massive lighting showroom for the best design solutions!